This morning Google sent an email to AdWords users announcing some changes to their policy. The update specifically targets the abuse of duplicate site links on Google ads, which Google says they’ll be taking a more proactive role enforcing. Sitelinks are additional display URLs that you can append to a specific ad to provide more click-through options to your web visitors. Sitelinks have been a success – they improve user experience, click-through rates, and consequently revenues for Google. Sitelinks must be unique, meaning each one should redirect users to a different landing page with unique content. Apparently Google has noticed an increase in sitelinks “created with the same landing page or the same content“. It’s a bit nonsensical to me as to why someone would intentionally use duplicate sitelinks – unless of course it’s by mistake. Ah, the importance of good SEO! 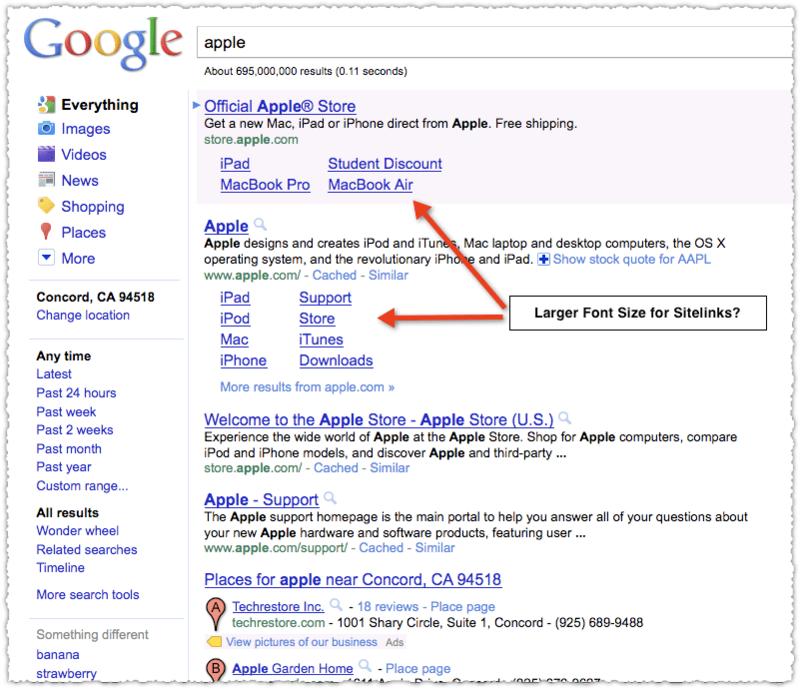 If you’re not familiar with sitelinks, the image below shows an example of sitelinks for the query “apple”. Below is the full email notification I received from Google this morning. We’re making a policy enforcement change that could affect the performance of any AdWords campaign that uses sitelinks. If you use sitelinks now, or plan to use sitelinks in the future, please continue reading to understand the changes and suggested steps you can take to avoid any negative impact to your campaigns. Sitelinks make your ads more valuable by showing additional direct links to specific web pages that you want to promote. Users get to specific destinations on your web site more quickly. And, on average, you’ll see a higher clickthrough rate for your ads. That makes sitelinks a great way to improve your campaign performance. To see images or learn more about sitelinks, please see this AdWords Help Center article (http://support.google.com/adwords/bin/answer.py?answer=2375416). To ensure that users have a good experience with ad sitelinks, our existing policy requires each sitelink in a campaign to link to a different landing page URL with unique content on the landing page. That means a user can expect a meaningfully different landing page experience for each sitelink. Recently, we’ve noticed an increase in the number of sitelinks created with the same landing pages or the same content. So in the coming month, we will begin more proactive enforcement of our existing policy. Initially, we’ll focus on new and recently changed sitelinks. As your ads are being served, our systems will verify that your sitelinks meet the policy standards. Sitelinks that don’t meet the standards will be restricted from appearing. Having fewer eligible sitelinks could keep your ad from showing in the larger 2-line and 3-line formats, where more eligible sitelinks are required. Remember, larger formats are more visible and typically have higher average clickthrough rates (CTR). And if you don’t have enough eligible sitelinks in your campaign, then your ads may not display sitelinks at all. We realize that manually checking and fixing duplicates for your existing sitelinks and landing pages might take some time and coordination. So we’re delaying more proactive enforcement with existing sitelinks for a few months. But don’t wait until the last minute. And remember, any sitelink that you add or change will be subject to proactive enforcement right away. To increase the chances of having more sitelinks shown with your ads, we recommend having 6-10 unique sitelinks in each of your campaigns. If you already have campaigns with sitelinks, we’d suggest reviewing each campaign to verify that it has 6-10 unique sitelinks. You’d probably want to start with the campaigns that show sitelinks most often. Usually, this would be a campaign with keywords like your business name and its best-known products and services. 1. Log into the AdWords interface and click on the “Ad Extensions” tab. 2. Select “Sitelinks Extensions” from the drop down menu. 3. Sort your sitelink extensions by impressions or clicks by clicking on the column header. 4. Click on each sitelink in the top campaign and follow it through to its landing page (there’s no charge for these clicks). 5. Fix any duplicates you find in each campaign by hovering over the extension area and clicking the pencil icon. For more information about sitelinks policy, please visit the AdWords Help Center (http://support.google.com/adwordspolicy/bin/answer.py?answer=1054210). You can also contact AdWords support with questions about this policy change or anything else related to AdWords (http://support.google.com/adwords/bin/answer.py?answer=8206). Thanks for your help keeping ad sitelinks unique and valuable for end users. We wish you continued success with AdWords.